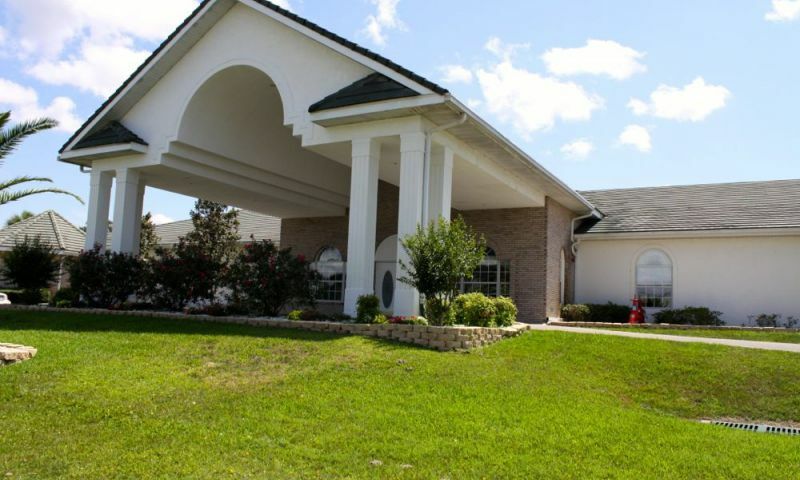 Ocala Palms is a gated active adult community located on North Highway 27 in Ocala, Florida. This 55+ community was developed by Venture & Associates and is nestled in the heart of horse country, yet Ocala Palms features convenient access to I-75. Gentle rolling hills as well as golf and country club-style living are at its best in Ocala Palms. Ocala Palms was constructed during the mid 1990s. As a result, the community offers an ideal blend of up-to-date floor plans within a community that has a well-established neighborhood, mature landscaping, and close-knit neighbors. Many active adult homebuyers are attracted to this mid-sized community because it offers all of the luxuries of active adult living without the large crowds and on-going construction. Although Ocala Palms is a relatively small active adult community when compared to some of the mega-retirement communities nearby, there is nothing undersized about its 19,000 square-foot clubhouse. A fitness center, indoor pool, arts and crafts studio, card room, multi-purpose room, sewing studio, billiards room, table tennis, and a library that provide plenty of space for recreation, relaxation and activities. Blanca's Cafe makes a convenient stop for meeting up with your friends and neighbors over lunch or dinner. The Magnolia ballroom also serves as a great space where residents can gather for meetings, parties, and events. For your out of town guests, RV Parking is available for a small fee. Residents have spectacular outdoor amenities as well. Active adults can swim in the outdoor pool, lounge on the sundeck, soak in the spa, or play at one of the tennis, bocce ball, and shuffleboard courts. There is also a horseshoe pit, volleyball court, and croquet lawn that keeps residents active with friendly competition in any of these sports. The 18-hole Ocala Palms Golf Course is one of the premier courses in central Florida. The 6,500-yard, par-72 course provides a formidable challenge for golfers of all skill levels. It boasts magnificent oaks, sparkling ponds, gorgeous waterfalls and magnificent rolling fairways. Golfers can also practice on the driving range and putting green so they can step up their golf game skills. Ocala Palms in Florida features 1,076 moderately priced single-family homes built between 1994 to 1997. Many houses for resale feature scenic golf course or water views. Homes range in size from 1,050 to 2,654 square feet. Single-family homes have two to three bedrooms, two to three bathrooms, and two to two-and-a-half-car garages. Some of the houses feature large oak trees in their yards for wonderful curb appeal. Homebuyers have a variety of floor plans to choose from. These homes accommodate a multitude of buyers aged 55 and better who are looking to downsize their living space and live a low-maintenance lifestyle. Houses in Ocala Palms feature concrete, block, and stucco with the occasional frame and vinyl models for added variety. Even with an activity director on-hand, this community features a take-charge approach when it comes to recreation and activity planning. Residents are in control of scheduling events and managing clubs. As evidenced by the regular newsletter with plenty of contributions by residents and the fully scheduled monthly activity calendar, this concept works quite well at Ocala Palms. Aquacise, croquet, volleyball, and golf are some examples of organized outdoor events. There are also clubs for indoor activities such as arts and crafts, bunco, poker, dancing, billiards, table tennis, book club, weight support, and bible study. Social groups, such as a singles club and the Lunch Bunch, are also popular at Ocala Palms. Ocala is a very family friendly city and offers countless options of restaurants and ongoing events. For family entertainment, Ocala features year-round theater performances, concerts, public festivals, dance recitals, and special museum exhibits. Picnics and hikes in Ocala's parks, or carriage tours, are a very inexpensive way to enjoy the beautiful outdoors. The Ocala National Forest, the Marion Theater, the Appleton Museum of Art, the Don Garlits Museum of Drag Racing, and the Howard Academy Community Center are also great nearby attractions. For a change of scenery, both Florida coastlines are about an hour's drive away from Ocala. Active adults looking for large-scale excitement or when the grandchildren come to visit, Orlando beckons with Disney World, Universal, Sea World, and Busch Gardens, which are only an hour away. Residents aged 55+ and better can enjoy living a maintenance-free lifestyle with resort-like amenities in Ocala Palms in Marion County, Florida. Royal Palms - 19,000 Sq. Ft. There are plenty of activities available in Ocala Palms. Here is a sample of some of the clubs, activities and classes offered here. Single-family homes within the Villa Series offer 1,050 to 1,364 square feet of living space. These homes have two bedrooms, two bathrooms, and an attached two-car garage. Fairway Series homes range from 1,175 to 1,378 square feet. These single-family homes have two bedrooms, two bathrooms, and an attached two-car garage. Single-family homes within the Master Series offer 1,311 to 2,120 square feet of living space. These homes have two to three bedrooms, two bathrooms, and an attached two-car garage. Championship Series homes have 1,849 to 2,076 square feet of living space. These single-family homes have three bedrooms, two bathrooms, and an attached two-car garage. Single-family homes within the Eagle Series offer 2,357 to 2,654 square feet of living space. These homes have three bedrooms, two to three bathrooms, and two to a two-and-a-half-car garage. Ocala Palms is an A+ community. Golf course is well maintained. Too many other amenities to list. Blanca's cafe is a well visited place for a good meal and entertainment. Residents are friendly and helpful. Homes are good quality and well maintained. Daily and monthly activities for all. Ocala Palms feels like home. The neighbors are friendly, the houses are well-maintained and reasonably priced. People care about keeping the community nice. We also like that it's a complete community (no more construction going on). We play bingo and bocce, horseshoes, poker and go on some of the trips with our friends. It's been fun trying new things and meeting so many good people. 55places.com is not affiliated with the developer(s) or homeowners association of Ocala Palms. The information you submit is distributed to a 55places.com Partner Agent, who is a licensed real estate agent. The information regarding Ocala Palms has not been verified or approved by the developer or homeowners association. Please verify all information prior to purchasing. 55places.com is not responsible for any errors regarding the information displayed on this website.